Egypt is a country principally located in Northeast Africa, but also containing the Sinai peninsula which joins Africa to Asia, and is considered part of Asia. The country borders the Gaza Strip, Israel, Libya and Sudan. It has coastlines on the Mediterreanean Sea and the Red Sea, and also contains the Suez Canal which connects these two bodies of water. 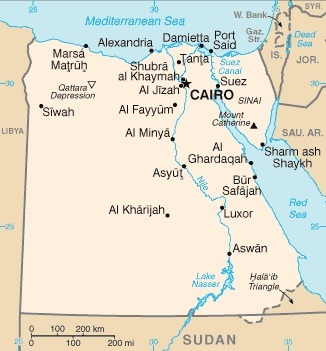 The population of Egypt, as of 2007, is estimated to be around 80 million. Most of the population, in excess of 77 million in fact, live with in a few miles of the country's main artery, the River Nile. This includes the capital of Egypt, Cairo, which is the largest city, and has a population in the region of 15.75 million. The economy of Egypt is principally based around agriculture, media, petroleum exports, and tourism, and has been undergoing rapid growth since the early 1990s when the government introduced market-orientated reforms. Additionally, remittances from Egyptians working abroad (especially from Saudi Arabia and other Persian Gulf states, as well as from Europe), also make an important contribution to the Egyptian economy. The government also greatly benefits from tolls collected from ships passing through the Suez Canal. 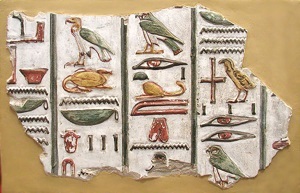 Egypt is very popular as a tourist destination. 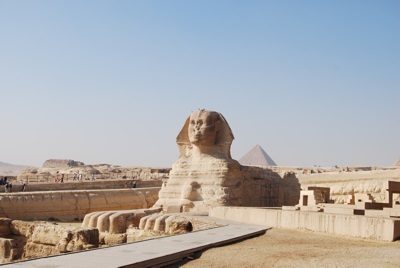 This is of course, in part, because of the country's many historic monuments such as the pyramids, and the sphinx, and in part because of the beach resorts found particularly on the Red Sea coast. DK Eyewitness Travel Guide: Egypt is your in-depth guide to the very best of the oldest tourist destination on Earth. Take day trips and excursions to see ancient pyramids, visit the monuments of the Nile Valley and the souks, mosques and madrassas of Islamic Cairo, experience local festivals and markets, and don't miss out on the delicious street food. Discover DK Eyewitness Travel Guide: Egypt. • Detailed city map of Cairo includes street finder indexes for easy navigation. With hundreds of full-color photographs, hand-drawn illustrations, and custom maps that illuminate every page, DK Eyewitness Travel Guide: Egypt truly shows you this country as no one else can. Recommended: For a pocket guidebook to Cairo, check out DK Eyewitness Travel Guide: Top 10 Cairo & the Nile, which is packed with dozens of top 10 lists, ensuring you make the most of your time in the city. National Geographic Traveler: Egypt, 3rd Edition takes you into the heart of ancient and modern Egypt, from Cairo and Luxor to the Valley of the Kings and Aswan Dam. You’ll find a plethora of new experiences, such as how to ride a camel properly, belly dance, and travel in the footsteps of the Holy Family. Lonely Planet Egypt is your passport to the most relevant, up-to-date advice on what to see and skip, and what hidden discoveries await you. Visit the ancient wonders of the Pyramids of Giza, cruise the Nile to a waterside temple, or see the glittering finds in the Egyptian Museum; all with your trusted travel companion. Get to the heart of Egypt and begin your journey now! The Perfect Choice: Lonely Planet Egypt, our most comprehensive guide to Egypt, is perfect for both exploring top sights and taking roads less travelled. Looking for more extensive coverage? Check out Discover Egypt, a photo-rich guide to the city's most popular attractions or Lonely Planet's Africa or Middle East travel guides, for a comprehensive look at all the region has to offer. • Make your trip to Egypt unforgettable with illustrated features, maps, and 241 color photos. • Best sailing trips down the Nile and camel rides in the desert.